Rotary success stories - New Zealand and SW Pacific: Another sneaky Rotary Moment! It was February and the time was fast approaching for our Rotary South Pacific Presidents Elect Training Seminar at Waipuna Lodge in Auckland. Our incoming delegates from around the Pacific were bringing their new enthusiasm and fresh ideas to share with others; the whole 400 of them! Naturally, we needed a traditional NZ welcome for the group. Sounds easy, after all, we Rotarians have great networks and well versed in putting on a good show right? Not so easy. The date clashed with the Te Matatini competition in Christchurch and Polyfest rehearsals around the country. Not a group could be found. Then, through a Rotary colleague at a secondary college in a low socio economic area, bingo, a small group of more junior children agreed to perform for us. In just two weeks they put together their show. (Their costumes were made by themselves, right from the cutting and dyeing of the flax.) Their teacher gathered them up early on Saturday morning 7 March as some families have no transport, gave them breakfast at the school and got them to the venue by 8 am. What a show it was with shining faces, strong but beautiful items, finishing with the powerful obligatory haka! The energy was palpable! The conference was told about the fundraising the group were beginning, to travel to Waitangi, to study NZ history and the signing of the Treaty of Waitangi. At recess, generous Rotarians willingly popped notes and coins into a Maori “kite” or flax basket, and on the Monday morning, myself, DGE Jennie Herring and Conference Chair Trish Boyle went to the school to present the money (koha) to the group. The rest, as they say, is history; read the thank you response from a fourteen year old below, addressed to all the Rotarians in the South Pacific. Rotary Moments, I am once again gently reminded, can sneak up and catch us by surprise. To The Rotarians of The South Pacific. 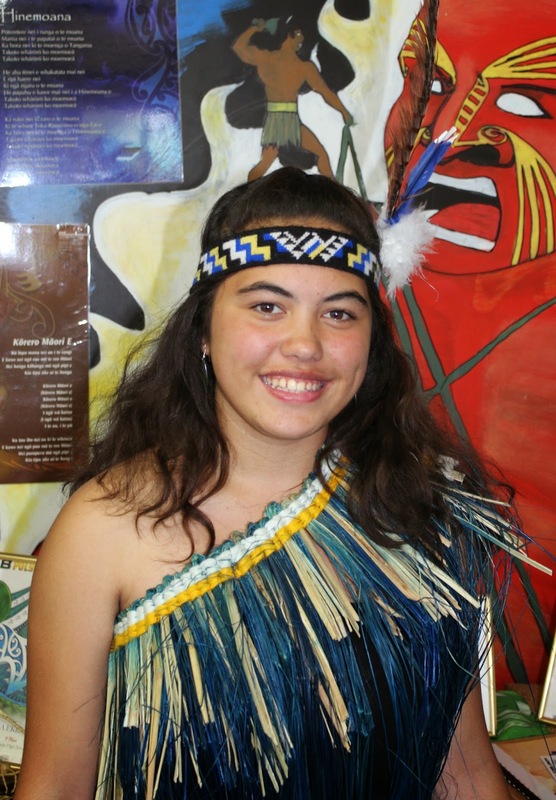 My name is Roberta, I am a student at Otahuhu College, and I am also a member of the Kapa Haka group. Last Saturday we had the privilege of performing for you at the Waipuna Lodge during your leadership conference. We had a fantastic time and we enjoyed seeing your smiling faces looking up at us. On Monday, the group and Whaea Darlene (teacher) and I were surprised when we were gifted a cheque for a thousand dollars from the conference people. We were so emotional we all cried including Whaea. I am deeply grateful for your generosity. It means a lot, not only to me, but every member of our Kapa Haka group. This year we are planning a trip to visit the Treaty of Waitangi and to experience the Far North. This koha has made a significant start to our fundraising ventures and pushed us closer to our goal. I was overwhelmed at the amount of kindness you showed us and the smile is still plastered upon my face. Performing for you has made me more confident about presenting in public. You have definitely enhanced my life in a most positive way. When I’m sitting on the bus to Waitangi, I will be thinking of all you Rotarians and your generosity, and how much you’ve contributed to our experience.